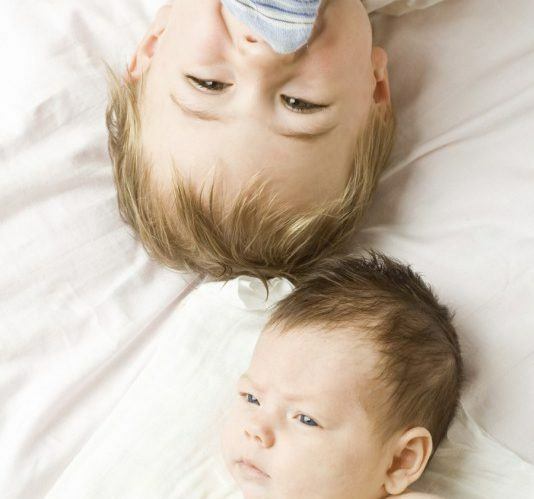 **And TMC Founder, Abbie Schiller, has some more tips to help older sibs adapt to the baby on the way — check out her helpful video about the benefits of making a New Sibling Chart here. What are a few tips for parents to help make for a peaceful transition for siblings when baby comes home? There are some important things parents can do to help older siblings in the transition to their new role as a big brother/sister who has to share their parents. The first, and possibly most important, is for parents to hold onto the idea that the first 6-8 months are going to be a time of transition and change for everyone, and that their older child may regress and/or behave in ways that are out of character for them. If we can normalize this hard time, and name it for what it is — a change that is going to take some getting used to — then everyone can feel more peaceful. There are some simple things that parents can do to help their older child feel more a part of things from the get-go. One would be to honor your older child’s birth before the baby is born. You can do this by making a book of their time in your tummy and birth, or just looking at photo albums. It’s a nice way to show her how important she is, help her understand what to expect, and assure her that she had the same attention and ceremony when she was born. When your older child first comes to the hospital, remember that she’s coming to see you — the baby may be an afterthought. She hasn’t seen you in some time, so protect her need to reconnect with you. Try to limit the number of people around when your child arrives. Keep it to you, your spouse, and child. In this moment, instead of having your toddler walk in to see you holding the new baby, consider putting your baby in the nursery (or neutral spot like the bassinet) just before your older child arrives. Have some special catch-up time and when it seems natural, go and get your newborn together. That way your older child is involved in bringing baby into the family. Try not to think of it as a photo op of the new siblings; your older child may or may not be interested in the baby, and that’s okay. She probably just wants to be with her parents at this point. Introduce the baby to your older child as “our baby” or even “your baby.” Even though it’s not technically correct, it can give a toddler or preschooler a sense of ownership and connection. If you like the idea of exchanging gifts between siblings, go for it. You can help your child pick out a special lovey, outfit or toy for the baby. Likewise, it can be very special to have a gift for your older child from the baby. When the time comes to bring your new baby home, have your older child come to meet you at the hospital. That way you can all drive home as a family, which makes it feel inclusive and like your older child is a part of something important. What kind of behavior from siblings might parents expect upon baby’s arrival? In working with second (and third and forth) time parents, I’ve seen older siblings’ behavior range from excited, happy and affectionate towards the baby, to ignoring the baby and pretending everything is normal, to being aggravated and upset. I often ask parents to imagine how you might feel if your partner brought home a new best friend who would now live in your house. Imagine your partner is hanging out with this new friend ALL the time, pays a lot of attention to them (when you used to be able to get your partner’s attention if you wanted it), and says you have to get along with their new best friend — even if you didn’t like them very much. Imagine that new best friend kept your partner up at night so they were tired and grumpy during the day. It really is an intrusion on the older child’s way of life, and, almost always, in the first 6-8 months after bringing baby home, they show us how they feel about it. This can show up in a couple ways: as nightmares and sleep disturbance (especially if mom was on bedrest and/or in the hospital for a long time, or if the baby is sleeping in the parent’s room); as a regression to earlier developmental stages where they need more help and attention (acting more like a baby); or acting out their feelings of sadness, jealousy, anger with aggression or pulls for negative attention. All of these are normal and, if given good support, will be temporary. I often have moms tell me their older child has become a terror, because negative attention is still attention. What is the best way to support the elder siblings’ big feelings but also create a healthy balance of attention from the beginning? The baby naturally gets lots of attention and time being held, which is very important to their development of healthy attachment. By feeding baby when they’re hungry, keeping them in dry diapers, and helping them sleep when they need to, parents are attuning to the baby’s needs for attention and care. Older children’s needs are more complex and their emotional worlds are more sophisticated, so they need more focused attention. Consider putting the baby in a sling to make focusing on your older child easier. My strongest recommendation to moms in my groups is to dedicate alone time to your older child EVERY DAY. Just the two of you, for a minimum of 20 minutes. This time is irrevocable — it isn’t a reward to be given when they’re good, or something that gets taken away if they’re acting out. It’s their birthright to have time to connect with their parent every day. And it’s like money in the bank — making sure to make regular deposits into their little love banks helps them to feel filled up when you need them to wait for you to feed the baby (for example). It’s helpful to tell your older child that this is your cozy time together, and you can even tell the baby, too! Use this time to follow your child’s lead, play whatever they want to play, to say “yes” as much as possible. It can be as simple as just getting down on the floor with them. In fact, it’s better if you’re not doing some big outing like a movie or the zoo — this time should feel like it’s about the two of you, so they can really feel your love. If siblings’ behavior takes a turn for the worse, how should parents react and handle it? What about with physical aggression? It is safe to expect that older children will show us, sooner or later, how upset they are about the change that happened in their house. I think it’s helpful to think of their acting out as being about the change, and not about the baby. That way we can take the blame away from the baby, which can make more room for them to connect later. And, it’s really not about the baby — it’s about mom and dad! It’s important to remember that we ALL can have a hard time with change — change is so hard! Many of us adults act out when there’s a major change happening — think about what happens for us in a move, divorce or a death. Having a new sibling is much the same. So most kids will hit or bite, or squeeze the baby too hard. Parents can help kids not go to that aggressive place by making sure you give them dedicated time every day, keeping them well rested and well fed, and keeping their routine in place as much as possible. Also, I would be mindful about when you decide to first start to leave your baby somewhere where you older child can reach them if you’re not there to monitor the interaction. You want to wait until the more intense part of the adjustment has passed. However, if and when an older child gets aggressive, parents need to be firm and clear, but not punitive. We want to teach our older children compassion, and they will get that when we are compassionate. So you can set the limit by saying, “we don’t hit in our house,” and then move the baby out of reach. Later, maybe at bedtime or during the bath, when you and your older child are calm (this is really important, for you both to be calm — we can’t learn when we are upset, and you want your older child to learn from their behavior here), you can talk about what happened. Tell the story in simple, non-judgmental language. You might say, “remember when mommy was making lunch and the baby was in his chair in the living room? And you saw the baby and you hit him? I wonder what you were feeling.” A younger child might not know what they were feeling, but you can take a guess. “I wonder if you were angry/ sad/ too hungry/ needing mommy’s attention.” This isn’t a time to blame, just a time to name what happened and how people felt. You could say, “mommy got upset, right? I was worried about the baby, and surprised to see you hitting.” And finally, you can remind them that if they need to hit, they can hit a pillow or the bed, but we are always gentle with the baby. Are there different tips for parents with siblings who are under 2 versus siblings where there’s a bigger spread like 5-6 years? When a baby is born to a family whose older child isn’t yet 2, it is more like having two babies. Both will need a lot of your time, physical body and attention. Chances are the older child is not yet verbal, and will be home all day (not yet in school). They may not ever remember a time when their sibling wasn’t a part of their life! With two under two, it’s important to plan for help and think of strategies to make the day easier ahead of time. Some things like: preparing frozen meals or getting help with food so you don’t have to cook in the evening; trying to coordinate naps so that at least once per day they both sleep at the same time; having classes to go to for your older child so they can work out some of their busy energy outside of the house; and, having help whenever possible. If this is your situation, it can help to know that life is particularly intense with two under two for a couple years, but that oftentimes they will begin to play together and entertain each other (giving you a much-deserved break) after not too long! On the other hand, when there’s more than a 5-year age difference, psychologically it’s considered to be same as being only children. That’s because children get all of their “magic years” from 0-5 without any other child to compete with. They each go through each developmental stage on their own; their sibling is doing very different things all along. These siblings can also play together and get along great, but the adjustment for the older child is different. It can be harder for them to adjust to the huge change of having a younger sibling, and they might not accept the “new normal” for a longer period of time. Of course, this all depends on your older child’s temperament — a girl who’s always wanted a baby sister or brother might be thrilled when she finally gets one! A boy who is slow to warm and doesn’t much like change might not think a new baby is a good thing at all. In either case, it’s important to keep as much of the same routine from before the baby as possible, to honor the challenges of adjusting to life with the baby, and to give your older child space to express their feelings in a safe way. What are ways to foster sibling harmony (that might last a lifetime) from the get-go? One way to understand the sibling dynamic is “a relationship with difference.” Whereas you pick friends because of what you have in common — you both like to paint and play dress-up — your sibling is a mandatory relationship where there may be a lot of differences. That being said, it can be an incredibly important relationship because it teaches you how to manage differences with someone. Siblings learn how to fight, how to make up and how to get along with someone that has different ideas. These are great skills for adult life! The research shows that parents who support siblings finding solutions together do well; this means that parents only get involved as much as the situation calls for — to protect safety, to prompt a new direction in the play, or to suggest that it’s time to find a solution. From the early days, you can notice with your older child how they positively impact the baby — like when the baby smiles or looks at your older child. Or you can say, “the baby is watching you!” as your older child plays or shows you a new trick they can do. You can’t force siblings to like one another, but you can leave them the space to have their feelings and to try new strategies to get along. If you can honor each child’s experience they will have a better chance of having a good relationship because they’re not at odds with YOU about their sibling. I think sometimes parents want their older children to help take care of the baby, which can also create a difficult dynamic. If your older child WANTS to help, that’s fine, but it is not their job to take care of their sibling. Essentially when there’s no pressure from adults to be any certain way, then they have the space to create their own connection. If they feel pressure from adults, they are more likely to act out. So, I would say to give your older child a lot of space to adjust and don’t pressure them and once they’re used to having the baby around they can find ways to connect. Rachel Stein, LCSW is a psychotherapist who provides therapy for adults and children, and parent consultations. She teaches a “Second Time Mommy Class,” and another on introducing new siblings at the Pump Station in Los Angeles. Find more at RachelSteinLCSW.com.